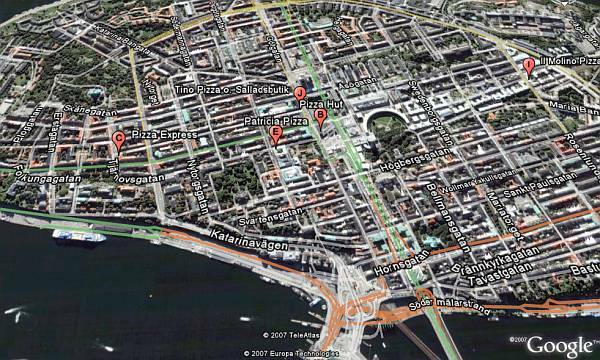 Google has released new map data for the country of Sweden. You can now turn on the "Roads" layer for Sweden, and you can now search for business listings (search for "pizza" for example). You can also get directions for road travel in Sweden. Google also announced on their Lat Long blog that they have Google Maps for Sweden at maps.google.se. The layers of point of interest (dining, lodging, etc.) have not been added yet for GE. Google already has roads for many countries around the world, and the list is growing every couple of months. Great job Google! 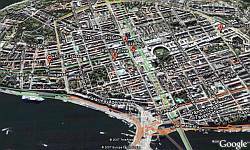 Where are the high res sat photos for Gothenburg? Disappointing that neither Microsoft nor Google have addressed this, given that Gothenburg is the second largest city in the country!